The cauldron of clouds above poured some of their contents upon us as we sped down Wrexham road; ceasing just as we put our capes on, and, though none of us would have given two-pence for the chances of a fine night at that moment, it kept fine after that, and the rest of the weekend our capes remained rolled up at the bottom of our saddlebags. What a false alarm rain really is! At Rossett we turned along the ‘same old road’ and eventually came to Cefn-y-Bedd which any guide book will tell you is a centre for the hill-growing industry, a ‘trade’ that is always busy in these parts. I think we all did some yawning on the endless climb to Bwlch Gwyn, which was reached at daybreak – about 3.30am, but after that the struggle against the wind over the moors, and the subsequent blind down into the upland Vale of Llandegla knocked all the sleepiness out of us. Walter might have been a fixture to our back wheels, so fast did he cling. Then we turned into another well used byway, the Corwen road, a road that is neither superb scenically nor dull, but just possess enough to make it an attractive route into the ‘inner regions’. But this time it was rather more than passing pretty, for we traversed it at that sweet time when the sun should be rising. I daresay it was, but we didn’t see it. The coolness of early morning, the freshness of the green things and the songsters in the trees are a tonic that one can’t help feeling revived by. Clear, cold water Bryn Eglwys help us get our second meal down. We found the Holyhead road rather dreary. Its long level stretches, its immaculate surface soon became boring, even though a good woodland valley is traversed from Druid. Rude Boreas gave three of us a whacking on the climb to Cerrig-y-Druidion, the fourth man, Walter remaining faithfully behind. Then for five miles to Pentrefoelas we took cover behind a motor lorry, obtaining thereby much relief. After that we had the tantalising ranges of Snowdonia before our eyes, a picture of grandeur, then, as that faded we had the company of the young river Conway, and the magic of the Holyhead road that one dreams of. The woodlands were splendid; the view down the Lledr Valley and over Bettws was an inspiration, something that called for a pause and reflections, whilst I thought that I had never seen Moel Siabod’s crescent of precipice look so well as it did that morning. From Bettws-y-Coed we ground our way uphill to Swallow Falls, where enough water was coming over to make them impressive. From Pont Cyfyng we found ourselves, as expected, up against it, ‘it’ being the wind which blew down the shallow valley of the Mymbyr in solid chunks, but when one has the tantalising crags of Snowdon just ahead, almost, one might say, almost within grasp, any kind of difficulty can be surmounted. As for comrade Walter, we couldn’t shame him into his share of pace-making and he elected to ride and walk as we rode and walked – only just behind us. So we stood at Pen-y-Gwryd again, looking up at the cliffs and the fierce clouds that tore across them. The hard walk up Bwlch Gwyddel to Gorphwysfa at the head of the Pass of Llanberis, where another pause is a matter of course, even to the most unimpressive being. 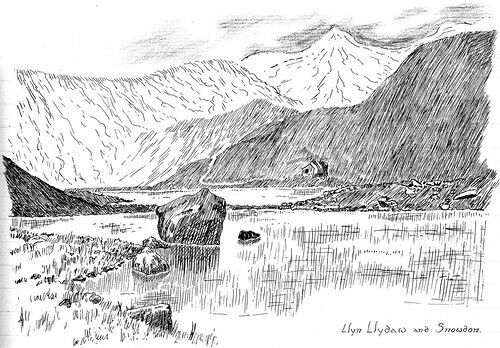 The descent of the Pass was slow – that nothing should be missed, and as we passed the spot where the long screes go up to the lone lake in Cwm Glas, envious eyes were cast at what we could see of Crib Goch and Clogwyn-y-Person. Sometime, I thought, sometime! That wish was gratified! The Pass was now behind us, and, sheltered, we tore through Nant Peris looking for Tom, who was not to be seen. As we passed the place where we had eaten them up at Easter, we fancied we saw an alarmed lady rushing indoors and banging the door – was it our fancy? Llanberis was reached now, and there we saw Tom and his friend ‘Danny’ and a roadster cyclist whom they had picked up en route. At breakfast we were Seven, merry, irrepressible, with an appetite between us that boded ill for any caterer not possessing a well-filled larder. With twelve hours of travelling we had covered 110 miles ‘up wind’ – three of us, that is, but now, well, here we were at the foot of Snowdon with two whole days to go as we please. Doesn’t it sound attractive? Someone suggested a morning boating on Llyn Padarn, which lay just behind the house, and the idea caught. 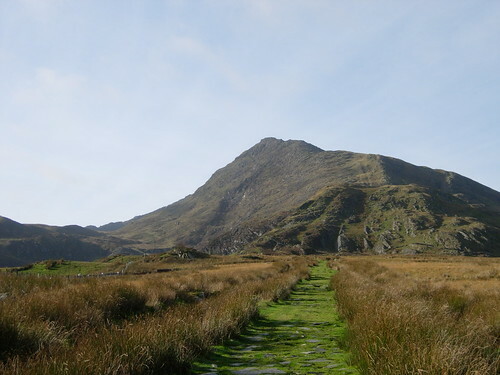 We had intended to the ascent of Snowdon, but from the motive of views it was useless, and again after a gruelling night ride it was trying a wee bit too much, perhaps. So we decided on boating. Off we rambled to the lake. The boats were there alright but they were half full of water, and no-one was about to look after them, so, not to be deterred, Billy and I found a couple of old pans, and after a good ten-minute ‘lading and teeming’ managed to bail one out. The others followed our example, and so we soon had a couple of boats ready for the water, five in one and Billy and I in the other. We showed the others how good oarsmen handle a boat, though at first we had a bit of a struggle to get her under way. The oars were a bit on the clumsy side with the result that they either went too deep or they missed the water, and simultaneously we would catapult backwards. This seemed to suit the coarse humour of the others. Then, as we did not possess a rudder, our progress was in a series of (more or less) graceful bends and swerves. We were making what Billy called a bee-line for the Nant Peris end, though I am inclined to think that the most dunder-headed bee in existence could make a better line than that! But when we really did get going we cut through the water like a tramp steamer, setting a fine example in oars-manship to the struggling mob in the other boat – I saw several people stood on the banks watching us, and applauding, though we didn’t actually hear the applause. Their movements suggested it, anyway. Once we had a race with the other boat, and despite the fact that we lost an oar and had to get out and walk a long way along the banks and wait for it drifting in, we won in a canter. From the middle of the lake is a striking view up the Pass, with Dolbadarn Castle picturesquely placed in front of a double row of mist-capped precipice, at the foot of which the debris-choked screes added that final touch, which makes this the reputed wildest pass in Wales. 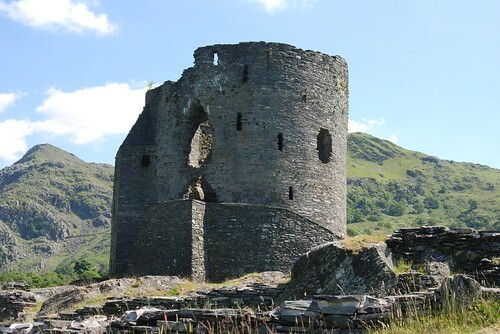 Llyn Padarn is said to be so deep that it has never been fathomed, and its situation at the foot of the pass makes it like a miniature sea during a storm. It abounds in fish, which, as a river runs through, includes salmon. After nearly an hour and a half we found that rowing was hard work, so we came in, in fear and trembling as the owner of the boats was waiting. He was a decent sort, however, for we got off for 6d each. After a walk round the village we turned in for dinner, and at 2pm left Llanberis by the same road that had brought us. The high wind was now dead behind, and the going was so easy that, arranging to meet my companions later, I rode all except a tiny bend of the pass, and, from Pen-y-Glas (the summit), I joined the disused cart track which runs to Llyn Llydaw. A hundred yards along the road got so unrideable that I abandoned my bike and continued on foot, until I had a fine view to the east down the valley of the Gwryd to Capel Curig and the rockies behind the twin Llyniau Mymbyr. In front the cliffs rose into a cauldron of hurrying mist, and a little to the right Crib Goch poked a pinnacled nose to meet the flying clouds. Snowdon was shy that day and did not even give us a passing glimpse. I did not go far, not even to stony Llyn Llydaw, for I had as good an outlook now as I should get anywhere. At Pen-y-Pass Billy and Fred were waiting, and together we swooped down Bwlch Gwyddel to Pen-y-Gwryd, and bowled before the wind to Capel Curig. The roadster cyclist had a puncture, which necessitated a long, long wait opposite the Swallow Falls, during which time we watched the motley crowd of motorists, cyclists and charabanc trippers disgorging at, or leaving the beauty spot. No beauty spot now, I trow, and different to what it was 9 hours ago! The chap with the roadster bike was loaded up with all sorts of luggage and gadgets, was an electrician by trade, married, and so, because of his speed (sic! ), trade and other things we called him ‘Electricity’. After kicking our heels for half an hour or more, the delinquent and his long-suffering touring companions ambled into view, and our reunited cavalcade swept down to Miners Bridge for tea. It was 7pm when we embarked on the last lap of 32 miles. After the stiff climb to Pentre-Foelas, the irrepressible Walter found the wind behind, and found his form as well, leaving us all ‘standing still’ as it were. Though we blinded like fury we could not catch him, so feeling it our duty to commemorate the event and honour (?) him, a secret plot was evolved. The Holyhead road bore us swiftly through Cerrig-y-Druidon to the Dee, to Corwen, and to the beautiful scenery beyond. Never in my life did I find so many flies as that night between Corwen and Llangollen. I fancy there must have been a number of mass meetings in flyland, for we kept running into batches of them, whilst our arms and coats were one greenfly carpet. Llangollen was reached at dusk, and we made ‘Bronant’ our quarters for the night.